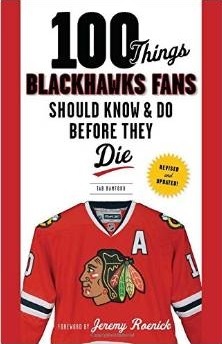 Daily Herald Blackhawks beat writer Tim Sassone has passed away. As this great piece from the Daily Herald remembers, many morning for Hawks fans over the years began with Sassone’s words over a bowl of cereal or cup of coffee. Last year, the organization honored Sassone with a jersey commemorating 25 years on the job. He was there for Roenick and Chelios and Belfour – when they arrived, and when they departed. He was there for the arrivals of Toews and Kane, and the two Cups they have brought Chicago (so far). I’ll remember Tim as a guy that was always willing to engage in conversation on the few occasions I had the chance to cross paths with him in the press box or at a practice. During the Stanley Cup Finals of 2010 and 2013, when the United Center was as busy as ever, he said hi to me by name in the bowels of the UC before Game 1. Once, when I was at a game with my mom, he introduced himself to her. He was the dean of hockey writers in this city not only because of tenure, but because he earned the respect of his peers. The hockey world lost a fantastic writer and better man. His family is in my thoughts and prayers, and I’m glad the team will observe a moment of silence before Tuesday night’s game. As I posted in the previous thread – he was the reason I even bought a newspaper back in the day before internet blogs and message boards. I’d buy the Daily Herald, quickly discard the other sections and scan the sports section for the Sassone column. Then I’d read it as slowly as I could muster so that it would last longer. Thanks for all the years of Hawks coverage Tim. Tim Sassone was simply the best at his craft. A gruffly guy with a big heart and who had the perfect temperament and talent to cover the NHL. He died much too young. Prayers are with his wife and two children . I cannot imagine how hard it is for the wife, kids and close friends but I know what this guy meant to a lot of people. I was tears today. Its like any grand father/mother in a way. “Many morning for Hawks fans over the years began with Sassone’s words over a bowl of cereal or cup of coffee.” Bravo Tab nicely done I could NOT have said it better myself! Thanks for that Tab…my best for his family, as Tim was a great family man! Had the opportunity to meet Tim, … all I can say is wow! He was a great journalist, and even a better person. God bless you and keep you my friend, … you made a lot of folks lives better!